"A Roller Coaster Ride of Full Frontal, High-Octane Action!" 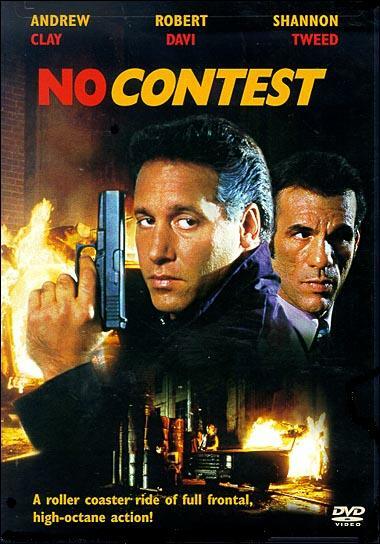 No Contest is a silly rip-off of Die Hard (1988). Sharon Bell (Tweed) is hosting a beauty pageant when Oz (Clay) and his band of criminals take over the proceedings. Now it's up to Sharon to save the day! This movie is worth-watching for the unintentional comedy. The climax is hilarious. Dice and Tweed battle it out on a rooftop using martial arts. The sight of Clay doing roundhouse kicks and other similar moves is very amusing. Tweed also can't do karate and there's always a long shot instead of a closeup. The acting by all is horrible, but it's not a big deal because you can't take this seriously. Taking a cue from such luminaries as Charles Sheen, Deborah Gibson, Joseph Lawrence and Jonathan Bon Jovi, you will note on the DVD box, this film stars, of course, Andrew Clay. Who's that? Does removing the Dice make people who wouldn't normally watch this kind of material suddenly come around? If you've been asking yourself "Can Andrew "Dice" Clay perform martial arts?" Rest assured: This is the movie you've been waiting for! saw a vhs at the thrift store titled act of evil. the last line on the backcover "it's die hard in an art gallery" sealed the deal for me. turns out it's no contest ii even though they didn't mention no contest 1 at all. so now i inadvertently owns the no contest series on vhs. Haha, very cool! No Contest II is just as silly as the 1st. In the 90s, "Die Hard in a..." were huge! Every video store stocked them. This is a decent one for once.